Disability hate crime is a serious and increasing problem in the UK. Hate crime is ‘criminal behaviour where the perpetrator is motivated by hostility or demonstrates hostility towards the victim’s disability, race, religion, sexual orientation or transgender identity’ (Crown Prosecution Service). For disabled people, it includes bullying, harassment, and sometimes physical assault, as well as financial exploitation. In England and Wales there were 5,558 hate crimes committed against disabled people in 2016/17, an increase of 58 percent on the previous year (Home Office, 2017); in Scotland in the same period, there were 188 recorded crimes, a small drop from 2015/16 (Crown Office and Procurator Fiscal Service, 2017). Although constituting a small proportion of all recorded hate crimes (about 7%), it is widely acknowledged that there is significant underreporting of disability-related hate crimes. Disability hate crimes can have a devastating physical and psychological impact on the individual affected and can create fear amongst other disabled people in the community. Despite the importance of the issue, and that disability hate crimes take place both in the public spaces of neighbourhoods, on city streets and on public transport, and in the private spaces of people’s homes, there has been little or no research undertaken by geographers (some research on religious beliefs and sexuality-related hate crimes, e.g. Listerborn, 2014; and Browne et al, 2011). In my recent Area article, I argue that geography has a significant contribution to make to the understanding of disability, and other forms of, hate crime. The dominant way that disability hate crime is understood is perhaps the reason for the lack of attention by geographers. There have been a small number of high profile cases of disability hate crime which have arguably determined the way in which the issue is perceived. In 2007, after months of harassment by a group of young people in their street in a Leicestershire village, Fiona Pilkington and her daughter Francecca, who had a learning disability, died in a car fire. In a number of reports by major disability charities, there were further accounts of abuse, violence, and deaths. Such events are traumatic for those affected and create fear and anxiety amongst many more disabled people. It has been vital to record the violence perpetrated against disabled people and to widen the existing hate crime legislation to include disabled people. However, it can be argued that, at the same time, these dominant accounts of violence mean we do not pay sufficient attention to the far more numerous, everyday incidents of ‘low-level’ harassment, such as being shouted at and called names in the street, being pushed past in shops, and being taunted online. Whilst in most cases not resulting in violence, these experiences can create fear and affect disabled people’s confidence to get out and about in their communities. Whilst a lot of attention has been, rightly, paid to the experiences of those affected by disability hate crime, I would argue that we also need to examine the reasons why such incidents occur. Why do people commit such crimes, and why do they occur in certain places? 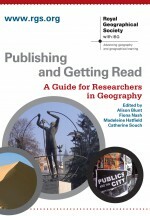 There has been almost no research on this, and so there is an opportunity for geographers to make a contribution. Some argue that people are motivated by a hatred of disabled people; others claim that it is the economic and social circumstances of the communities where the incidents happen that shapes people’s negative attitudes towards disabled people. A small survey (by Katherine Quarmby, 2015) of disabled people who had experienced a hate crime, found that their understanding of why they had been targeted was that it was mostly to do with perceptions of disabled people as benefit ‘scroungers’ or ‘jealousy of perceived “perks” of disability’, such as an adapted car or reserved parking space. Evidence suggests that disability hate crimes happen anywhere that disabled people are present – in the home, the street, college, shops and on public transport. However, they do not always happen in these locations – so we need to shift our attention to the unfolding of such incidents, and the factors or ‘triggers’ that cause them to happen. In a study of ‘race’ hate crime, Iganski (2008) showed that most such hate crimes were opportunistic, the outcome of ‘random encounters’, and were more likely to happen in busy areas and/or when there is a dispute over access to services in a neighbourhood. There could be a similar explanation for the incidence of disability hate crime: widespread negative discourses of disability, and specific local and micro-scale sites, situations and social interactions, combine to make incidents of harassment and violence more likely. The Equality and Human Rights Commission (2011) identified designated disabled person parking spaces as sites where such negative attitudes and social interactions sometimes come together to generate incidents of hate crime. This is where geographers should be focusing their attention. Talking to disabled people, and possibly perpetrators of disability hate crimes, could enable us to make maps of the specific spaces and social situations, and triggers, where and when disability hate crimes are likely to occur. Importantly, this would provide the police and other organisations with fresh insight into enhancing their responses to, and prevention of, disability hate crime. This entry was posted in Uncategorized on July 16, 2018 by RGS-IBG Managing Editor: Academic Publications.